Dyrhólaey Lighthouse (Icelandic: Dyrhólaeyjarviti) on top of the Dyrhólaey peninsula in front of dark clouds illuminated by the low morning sun. Dyrhólahverfi is in Suðurland at the south coast of Iceland. This photo was taken in the morning of a sunny day in September of 2013. 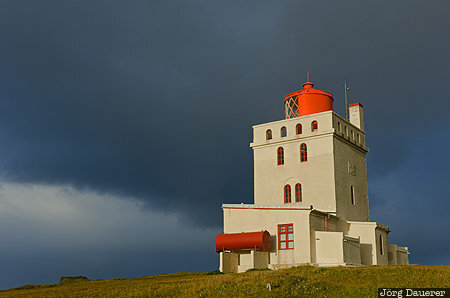 This photo is part of the exhibition Lighthouses of Northern Europe (Oct'15). This photo was taken with a digital camera.